Junk and rubbish removal in Brisbane. As your friendly Brisbane rubbish removal company we take care of every kind of trash / garbage / waste / rubbish removal and junk disposal required for our domestic and residential clients! We can remove whitegoods, old furniture and mattresses, collect garden rubbish and leave everything neat and tidy. If you need an end of lease clean up, pre-sale clean-ups or under house clear outs we can help. Our commercial rubbish removal guys are experienced in office clearouts plus we take care of rental property rubbish and other real estate rubbish removal services such as deceased estates, end of lease clean ups, pre-sale clean-ups, under house clear outs and garden green waste removal. We also service a number of retail shopping complexes, hospitals and schools. We also love working with our Brisbane shopfitter clients. Looking for rubbish removal in Brisbane? Brizzy Rubbish Removals can help with any junk or rubbish collection and rubbish removal requirement. Why call us? Because you’ve got better things to do than mess around with junk and rubbish! Let professional rubbish removers take care of it for you. From Brisbane garden waste removal to household junk removals in Brisbane and yes even office junk clean ups and clear-outs – we have all your garbage removal needs covered. We take care of whitegoods removals too so you can claim back your space, free up your time and choose our easy, no-fuss solution for your junk and rubbish. 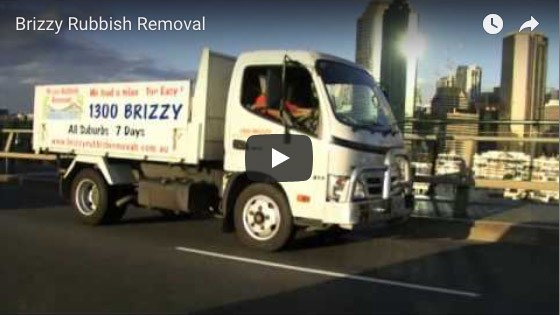 Brizzy Rubbish Removals serve the Brisbane CBD and all Brisbane suburbs including Brisbane’s Northside, Brisbane Southside, Western Suburbs, Centenary Suburbs and all Brisbane Metropolitan areas. We have a variety of vehicles (rubbish removal trucks) & trailers for all kinds of rubbish collection, garbage removals and waste disposal and we provide the fastest response times for collection in Brisbane. Not to mention the fact that we have years of experience in Brisbane and we’re NOT A FRANCHISE! We can take dispose of pretty much every kind of junk disposal required for domestic and commercial clients! Trash/garbage/waste/rubbish removal, anything you need to get rid of we do it all. Access is not a problem. If your building has lifts or your home has stairs – no problem! Getting in under houses is fine too. Our guys are experienced and efficient in any situation. We are an eco friendly business ensuring we recycle as much of your rubbish as possible. There are many rubbish recycling opportunities in Brisbane. To learn more about our Brisbane rubbish removal services and junk removal in Brisbane , read our frequently asked questions or get in touch for an obligation free estimate. We can take care of your rubbish removal jobs quickly and efficiently.